When Jesus condemns the Temple as a “den of thieves,” is he launching an attack on the aristocratic priests who ran the Temple? Were the priests actually corrupt in the Second Temple Period? The commentary on Habakkuk from the Qumran Community refers to the high priest as the “Wicked Priest” (1QpHab 1:13, 8:9. 9:9, 11:4). This high priest appears to have used the Temple to increase his own wealth. (1QpHab 12:8-9). 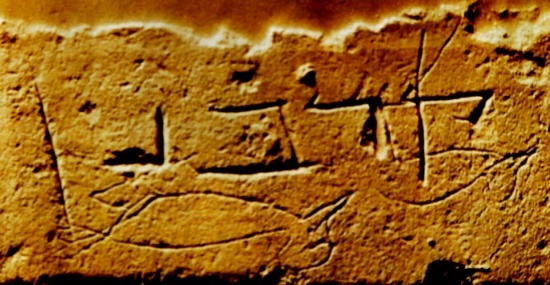 1QpHab 8:9-13. Its interpretation concerns the Wicked Priest, who was called loyal at the start of his office. However, when he ruled over Israel his heart became proud, he deserted God and betrayed the laws for the sake of riches. And he robbed and hoarded wealth from the violent men who had rebelled against God. And he seized public money, incurring additional serious sin. And he performed re[pul]sive acts by every type of defiling impurity. 1QpHab 12:8-9 Its interpretation: the city is Jerusalem in which the /Wicked/ Priest performed repulsive acts and defiled the Sanctuary of God. The violence (done to) the country are the cities of Judah which he plundered of the possessions of the poor. The Testament of Moses was probably written about A.D. 30, and the Habakkuk scroll from Qumran dates more than 100 years prior to that. Josephus accuses the priests of bribery (Antiq. 20.9.4) and violence (Antiq. 20.8.8). There is therefore evidence from before and after the time of Jesus that at least some Jews thought the priesthood was corrupt. 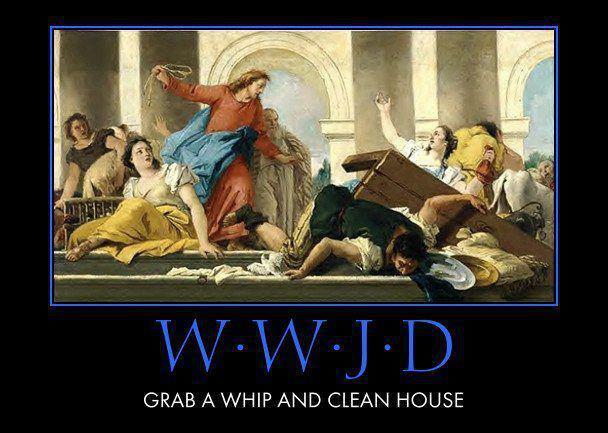 When Jesus called the Temple aristocracy a “den of thieves,” he was not the only voice calling the priesthood corrupt. E. P. Sanders, however, considers all of the evidence as a “polemic” against the Temple and perhaps not the best description of the average priest. There probably were some corrupt priests, but the average priest was probably diligent about keeping the Law. When we read about uprisings and rebellions in Josephus, it seems as though any time the Temple is disrespected (either by Rome or Jews) a riot breaks out and people die. If there were corrupt priests who were known to be stealing from the offerings or creating laws for the purpose of profit, then there would have been a popular response. Sanders illustrates his point with a story from Babylon at the time of Alexander’s conquest. Temples were destroyed and priests returned to their own land. Tithes and offerings were gathered to re-build the temples but the priests never did the work. They kept the money and spent it on their own pleasure rather than to rebuild the temples. This sort of corruption is nowhere found among the Jewish priesthood. As a final argument, Sanders points out it was the ordinary priest who declared war on Rome when Florus stole from the Temple treasury. Whatever we might say about Jewish religion in the first century, the priesthood remained loyal to the greatest symbol of their religion – the Temple. Bibliography. Martı́nez and Tigchelaar, The Dead Sea Scrolls Study Edition (Translations). Leiden: Brill, 1997–1998; James H. Charlesworth, The Old Testament Pseudepigrapha. New York: Yale University Press, 1983; E. P. Sanders, Judaism: Practice and Belief 63 BCE – 66 CE. Philadelphia: Trinity Press, 1992. It seems strange that there were vendors set up in the Temple courts selling animals. Usually Christians think of these people in a very negative light, since Jesus does run them out of the place and calls then a bunch of thieves. Christian preachers sometimes over-emphasize that the sellers were taking a very high profit from the Passover visitor who must by an animal at the Temple. I myself am guilty of drawing an analogy to buying food at an airport, it is always more expensive since there is no free market. But is this a fair reading of these “sellers and money changers”? Who are these people selling animals and changing money in the Temple? It was very difficult to travel to Jerusalem with a lamb for the Passover sacrifice. If it was injured or found to be in some way unclean, then the worshiper would not have a sacrifice for the festival. To assist people in their Temple authorities sold “pre-approved” lambs for people traveling from the Diaspora for the Passover Festival. The sellers are vending oxen and pigeons along with sheep. These might be thought of as the high and low end of the sacrifice scale. A wealthy man may choose to sacrifice an ox while a poor person could only afford a pigeon. Doves were required for women making a cleansing sacrifice, only the High Priest was required to make a sacrifice of a bovine. Both of these types of sacrifices would be difficult to deliver to Jerusalem, especially if the worshiper was traveling from a distant city such as Ephesus or Rome. It would be virtually impossible to bring an ox that distance, a pigeon might not last the whole trip! These sellers are therefore providing a reasonable service to travelers arriving at the Temple. The pilgrim could be sure that they could purchase an acceptable animal once they arrived at the Temple. Why would they sell the animals in the Temple courts? Ed Sanders questions whether anyone would sell animals in the court of Gentiles since there would be a great deal of straw, excrement, and noise – all of which would be offensive to the worshipers entering the Temple. There were shops outside the Temple which could be used to sell animals and change money. Von Wahlde, however, points out that Sanders may be correct for normal times in the Temple service, but during Passover such a huge number of sacrifices were required that it is possible that booths were allowed in the court of the Gentiles in order to handle the crowds. None of the Gospels imply the whole Gentile court was given over to the selling of animals. Perhaps a larger area was open for sales during the Passover, at other times sales were prohibited. Either way, for the most part these sellers were providing a service most people found helpful. If this is true, what was Jesus problem with the sellers and money changers? In Mark, the Temple incident is framed by the curse of the Fig Tree and provides the clues we need to fully interpret that parabolic action. In fact, this action is also symbolic. Jesus arrives at the Temple as the messiah, inspects the Temple and finds it corrupt. He begins his final week with a dramatic disruption in the area used for selling sacrificial animals. The Temple complex was huge. The area with buying and selling was approximately 450×300 meters! Craig Evans suggests it is unlikely that Jesus completely disrupted all commerce in the area, and most people would not have been aware Jesus was making a demonstration in one area of the Temple. The action is symbolic. By overturning tables and causing the chaos that he does, he challenges the religious authorities to be obedient to scripture by making the Temple a house of prayer and not a den of thieves. Jesus performs a symbolic action like classic prophet from the Hebrew Bible. The prophets regularly criticized the Temple leadership, especially in Jeremiah (7:14, 34; 12:7; 22:5; 22:5; 26:9). Since Jeremiah is a favorite text of Jesus, it is no surprise Jesus would allude to Jer 7:11 in his critique of the Temple. As with Jeremiah, this confrontation with the temple authority can lead only to physical danger and arrest, but at this point the authorities cannot take Jesus for fear of the crowd. Jesus’ criticism of the temple does not end with the Temple incident. The conflict with the Temple aristocracy continues in his teaching in the courts during his final week. The Parable of the Tenants has the priestly aristocracy losing their place of privilege. The challenge to Jesus on paying taxes is radical – give to god what is God’s, not necessarily via the temple tax! Even the Widow’s mite is a condemnation of the giving of the wealthy. 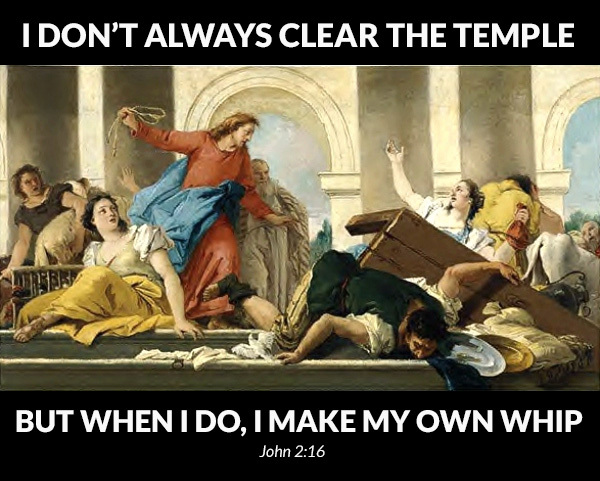 The “Temple Action” is therefore a public sign of Jesus’ authority as a prophet of God. He stands in the tradition of Jeremiah and Ezekiel who condemned the priesthood and Temple authority for their half-hearted worship of God. Jesus is challenging the worshipers in the Temple to become True Israel, but is he proposing separation from the Temple? Does Jesus preform a symbolic action (like Jeremiah) which calls for the reformation of the Temple? 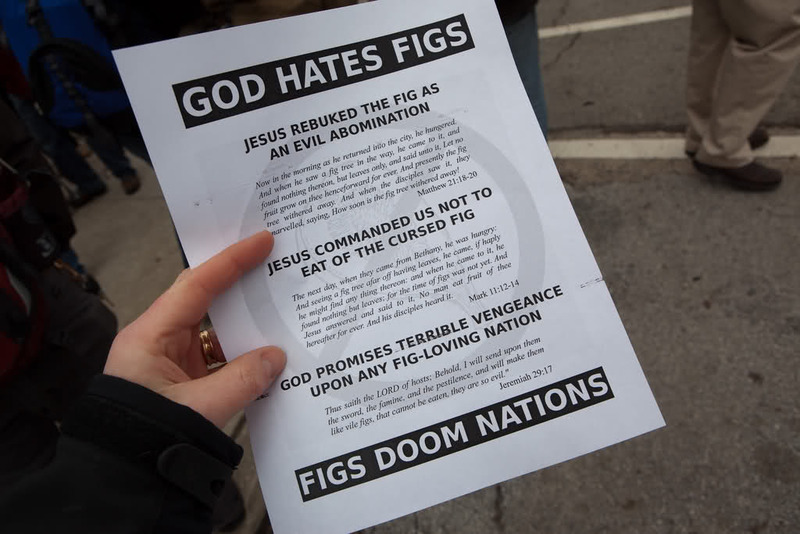 What is the meaning of the cursing of the fig tree? This is a symbolic action, dealing with more than a tree that doesn’t bear fruit. The context is important since this is an example of a “Markan Sandwich.” Mark often begins a story, then drops it and tells another longer story, returning to his original story at the end. The material inside this sandwich is the Temple Incident. 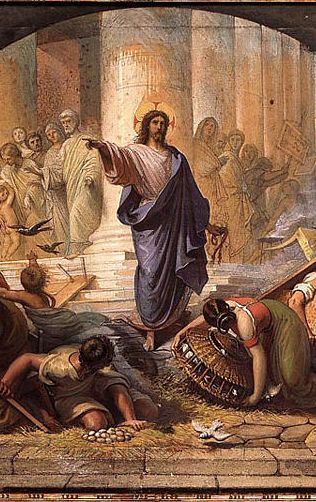 Jesus condemns the Temple as a “den of thieves” and overturns the tables in order to disrupt business. There are several “conflict stories” following this section of Mark in which Jesus teaches in the temple. If it is not the time of year for the fig tree to have fruit, what did Jesus expect to find? Some think “winter figs” which are left over from the previous harvest,” or “early figs,” which were hard, immature figs. But the tree has leaves since it is mid-April, therefore Jesus approaches it with the expectation that it will have fruit, but it does not. It has leaves, but no figs, ripe or not. If the tree was barren, then perhaps the regular metaphor from the Hebrew Bible of a barren tree is in mind. A barren tree is used for Israel’s unfaithfulness (Isa 28:4; Jer 8:13; 24:1–10; 29:17; Hos 9:10; Mic 7:1; Nah 3:12; Prov 27:18) or God’s judgment (Jer 7:20, Ho 9:15-16). These are not unrelated metaphors and both are appropriate here. Jesus is looking for fruit in a place he has every right to find fruit, but does not find it. In the same way, he came to the nation looking for fruit, but did not find any. The religious establishment is a barren fig tree that is about to be cut off. Where did Jesus have every right to find a fruitful religious heart in Israel – the temple. The curse is that the tree will not produce fruit until the end of the age. Some take this to mean that Jesus expects the end of the age before the next fig-harvest, but the phrase “end of the age” always has an eschatological sense. Craig Evans, suggests this means that the tree is cursed “forever” although in the light of Romans 11 and the probability of future of national Israel. After the events in the temple, the third after the curse is pronounced, the disciples see the tree and note that it is dead – withered from the roots up. There are a number of Old Testament allusions here (Ho 9:16, Job 18:16, 28:9, 31:12, Ezek 19:9). The nation has gone past the point of no-return, they have rejected the Messiah. If this is a legitimate way to read this parabolic action, how would it effect the way we read the “Temple action”? Perhaps thinking beyond the Gospel of Mark and Paul’s comments in Romans 11:11-32, does this fig-tree parable make a difference for understanding Israel as the people of God in the present age? 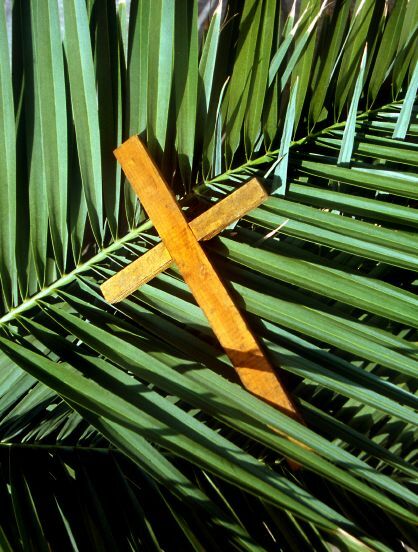 Each of the Gospels describes Jesus entering Jerusalem as a “triumphal entry.” This is an event which Christians typically celebrate a week before Easter as “Palm Sunday,” at least in my youth by letting little kids wave fake palm branches and retelling the story of Jesus coming to Jerusalem riding on a donkey. As is usual, the pop-Christian even misses the significance of the palm branches and the other imagery in the story. There are several important symbols of Jewish nationalism in the Triumphal Entry. First, palm branches were a part of Jewish nationalism since the time of the Maccabees. When Judas Maccabees brother Simon defeated the Syrians in 141 B. C.., the people celebrated with great music and the waving of palm branches (1 Macc. 13:51). Palms also appear on the coins dating to the first Jewish revolt against Rome in A.D. 66-70. Images of palm branches will be used later in the coinage of the Bar Kohkba revolt in A.D. 132. Second, the cry of “Hosanna” is drawn from Psalm 118:25-25. The word means “save us, O Lord!” The psalm was one of the pilgrim Psalms, sung by those who were going up to the Temple during a feast. Psalm 118:26 was often taken as a reference to the Messiah, when the true the King of the Jews he will save his people. The rest of Psalm 118 is important as well. Verses 10-13 describe the writer as in the middle of his enemies, nations which surround him on every side. Verse 17-18 says that the Psalmist has been disciplined severely, but has not been handed over to death. “I shall not die,” he says, “but I shall live.” Verse 19 describes the gate of righteousness through which the pilgrims must enter, Jesus has already described himself as the gate through which the sheep must pass. Verse 22 the psalm refers to the stone the builders rejected becoming the chief cornerstone, a verse Jesus applies to himself in the parable of the Vineyard. Third, that Jesus rides a donkey is an allusion to Zechariah 9:9, another text associated with the coming messiah. John does not give the details since they are likely well-known by the time he writes his book. He does emphasize the fact that Jesus deliberately chose to ride a donkey, intentionally evoking the prophecy of Zech 9:9. The point of this sign is often missed since it is thought riding a donkey is a sign of humility and peace. It is true that David came to Jerusalem after his son’s revolt “in peace,” riding a donkey instead of a war horse. A better explanation of the donkey is to see that after Solomon was anointed king, he was placed on a donkey and led up to the city of Jerusalem, through the Kidron valley. The anointed son of David, the king named “Peace,” enters the city of Jerusalem to begin the most peaceful and prosperous period in Israel’s history. Zechariah 9:9 is alluding to that story in the Hebrew Bible, Jesus is the true Son of David who will bring ultimate peace and prosperity, but only after he destroys the enemy of his people. Rather than the Romans, Jesus will enter Jerusalem and offer himself as the ultimate sacrifice for sin. What other events of the final days of Jesus ministry hint at his messianic role? Logos Bible Software is offering an excellent book for their “Free Book of the Month” promotion. Partnering with Fortress, Logos is giving away a copy of Jürgen Moltmann’s The Crucified God: The Cross of Christ as the Foundation and Criticism of Christian Theology. Originally published by SCM Press in 1973, Fortress Press reprinted the book in paperback in 1993. Langdon Gilkey said “This is Jürgen Moltmann’s best and therefore most important book. He has substantially changed the central thrust of his theology without sacrificing its most vital element, its passionate concern for alleviation of the world’s suffering.” This challenging 364 page book is a worthy addition to theological library. In addition to this free book, Logos is also offering an “almost free” book, Moltmann’s Theology of Hope: On the Ground and the Implications of a Christian Eschatology. Gilkey described this book as “a stimulating and important book, a ‘must’ for every theological student and every preacher who wishes to become acquainted with the most significant movement in contemporary continental theology.” The book is only 99 cents for a limited time. Be sure to enter to win a 22-volume Jürgen Moltmann Collection. Time is running out, the offer expires October 31. Head to Logos and download the free book while you can! Exodus 21:17 “Anyone who curses his father or mother must be put to death. Leviticus 20:9 “‘If anyone curses his father or mother, he must be put to death. He has cursed his father or his mother, and his blood will be on his own head. Qorban is an Aramaic word (קָרְבָּן, κορβᾶν) referring to something giving as a gift to the Temple, whether to a sacrifice, oath, or gift. Mark 7:9-13 refers to a way two law as could be set against one another in order to circumvent the original intention of the Law. This flows logically from Jesus’s rejection of hand-washing for ritual purity. Ritual purity does not necessarily mean the Law has been kept in “spirit and in truth.” The qorban tradition illustrates his point well. Some Jews noticed a potential tension between the command to honor one’s parents and the commands to honor oaths, especially to oaths to God. Someone might potentially make an oath to give to the Lord gift of property or money. They Temple could receive the oath as a promise but not necessarily collect the oath until a later time. By analogy, compare this to a faith-promise commitment to a building program at your church. You promise $10,000, but the church does not need it right away. You get the “spiritual benefit” of giving money without actually taking the money out of your bank account. R. T. France points out two elements of qorban based on this story. First, the original qorban is unalterable. Someone swearing such a vow cannot break it later if it turns out to be a bad decision! Second, the property remained at the disposal of the son even after he made the vow. His father could not touch it, but he could. Usually Evangelical Christians chuckle about the hypocrisy of “those Pharisees” and contemporary preachers rail against the “traditions” of the Pharisees. But is this really fair? If the goal was to keep the Law of God, the the Law must be correctly interpreted and applied. How is this qorban tradition any different than a Christian finding a way around head-covering (1 Cor 11:2-16) or Paul’s command to keep women silent in the church (1 Cor 14:34-35)? I do not think Jesus is against trying to keep the commands of God, but what is it about this particular practice that bothers him so much he is able to call it a sin? When we find some exegetical warrant to set these things aside, are we not dismissing the commands of God?